Purple color have several precious and semi-precious stones. For some of them this is the only shade for other possible species. Jewelry rare variety of chrysoberyl called alexandrite, has a pleochroism. Daylight natural light colouring of the stone is bluish-green or emerald green, but under artificial lighting in the evening he has red, crimson, purple or violet color. Can be confused with alexandrite, or the widow's stone, as it is called, with synthetic corundum, which has the same properties. This stone is highly appreciated by jewelers. The variability in coloration in Europe this stone was a symbol of jealousy, amorousness, and a stone of luck. It was also believed that natural alexandrite, depending on the situation can change suddenly, your day color-night to warn of the danger or other serious situations. Also there was a belief that in severe situations, the color of the stone can even come close to yellow. Call amethyst quartz crystals purple shades. 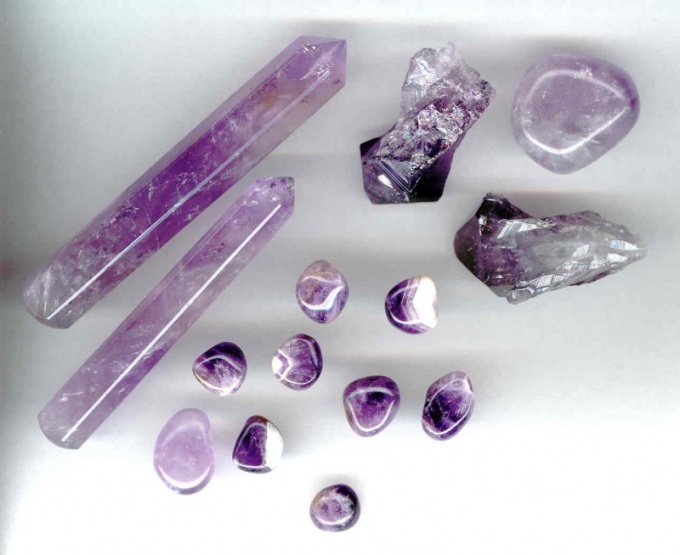 Most often, the amethyst is found in the form of crystals, druses and brushes. Lithotherapists say that this stone gives people insight and helps to control evil thoughts, extinguishes anxiety and emotional pain. This stone is especially good for people with weak and unstable aura. It has long been believed that amethyst is an amulet against drunkenness. Is suitable for such zodiac signs like Aquarius, Gemini and Libra. The mineral is opaque purple in color with a silky Shine is a charoit. Some specimens show chatoyancy. This jewelry and ornamental stones, which are made from a wide variety of artistic products. Their variety is very large - made from charoite vases, boxes, bowls and table decorations, decorative panels and accessories. Made from charoite and trinkets, pendants, bracelets and rings, inserts into rings, earrings and cufflinks. It is believed that wearing a talisman from charoite people better feels the world around us. This stone awakens from bearing his intuition, promotes broad understanding and awareness of life, gives a sense of unity with the world and contributes to spiritual development. This very rare gem purple is a variety of garnet. It was discovered not so long ago, in the 70-ies of the last century in Australia, in the place where it was recorded fall of a meteorite of Boorara. Since it is assumed that the formation majority need is a natural phenomenon, as they are formed from the shock wave. This type of garnet, however, can be found in the bowels of the earth - it is formed deep underground, at a depth of at least 400 km. It is also believed that majority will cease to be luxury when humanity will master the moon and Mars, as it was there for the appearance of these stones in large numbers most favorable conditions.